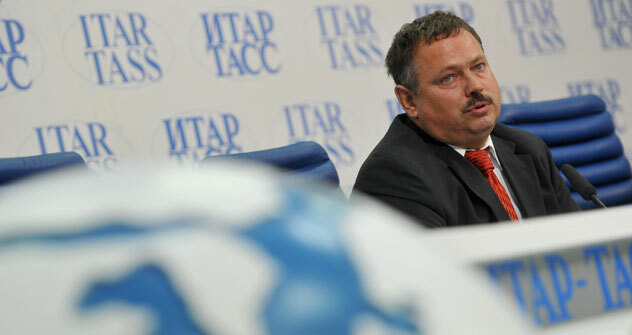 Maxim Medvedkov, head of the Department for Trade Negotiations at the Economic Development Ministry. Source: Alexander Utkin / RIA Novosti. RBC spoke to the man who had been leading negotiations on Russia’s long WTO accession about what benefits membership will bring. Russia has become a full member of the World Trade Organization (WTO). Julia Sinaeva of RBC Daily spoke with Maxim Medvedkov, head of the Department for Trade Negotiations at the Economic Development Ministry, on why the accession process took 18 years, how many new personnel will be required to work within the new framework and whether the safeguard measures to protect the industries that “lose” as a result of the accession will result in lawsuits. RBC Daily: Russia had been working its way into the WTO for 18 years. As someone who was directly involved in this process, can you recall the highlights of the campaign? What were the chief obstacles and how did Russia manage to overcome them? Maxim Medvedkov: There were many, but there was a lot of routine work as well. It’s normal life, but for one exception – it was very hard to schedule the negotiations. They were affected by too many factors, external and internal. It was impossible to predict all of them. Also, the accession talks were quite different from regular trade negotiations, because each candidate is doomed to making unilateral concessions. Reciprocity is only displayed in the fact that the acceding economy must convince the WTO member-states that the concessions it offers are reasonable and sufficient, and in response get the green light to complete a relevant area of talks. There were a few dozen areas. RBC Daily: By this autumn, there will be a strategy for protecting Russia’s national interests within the WTO. What is the essence of this strategy? What should it contain? M.M. : The draft is ready. It outlines the framework for our future position within the WTO, the focus areas in which we will be active. We will hardly be playing in all segments in Geneva, as we do not have sufficient resources, and there is no need for this. We will hardly torture WTO accession candidates by demanding unimportant concessions from them. One of our priorities is to facilitate the fastest possible accession of Kazakhstan and support the efforts of Belarus. There will be lots of everyday work, specifically with a view to lifting restrictions imposed on Russian exports. RBC Daily: It was mentioned that Russia is understaffed for acceding to the WTO – this opinion is shared by officials, Duma deputies and experts. They mention 300 people. Do you think they are right? What kind of people exactly are needed? M.M. : Operations inside the WTO are more complicated than the work to accede to the organization. The number of specialists depends directly on the role we are going to play within the WTO. The “passive observation” scenario calls for an additional 25-30 specialists to meet some of the WTO requirements, such as those concerning trade regime notifications. If we want to be active and assert our interests in Geneva, we need many more, at least 300 people for such a scenario. Why 300? Our bureaucratic labor productivity in this area is too low. We have lost our experience of multilateral trade diplomacy. A WTO expert should spend at least one day a week, or better two days a week, reading special documents and upgrading his qualifications. But he can’t find this day during a whole month now – there are too many meetings, conferences, reports, So we need more experts. RBC Daily: Does the Economic Development Ministry think Russian companies are ready for the WTO? M.M. : The main adjustment that affects companies is lower import duties. Some will benefit, whereas some will have to deal with this challenge. The state must stand by business and support it, should imports cause problems, especially during the first few years within the WTO. The government has adopted an economy accommodation plan to provide this support for business. RBC Daily: Some experts and foreign specialists believe that the law introducing the scrappage duty will produce a negative impact on Russia, as it discriminates against foreign makers and runs counter to the WTO rules. It is a WTO rule that, if an importing country claims its rights are infringed on, it is entitled to initiate a judicial inquiry. Can you comment on this? M.M. : Many countries apply a similar duty. It does not run counter to any WTO rule as it is. The duty will be paid by importers and domestic makers alike. If our trade partners have problems with this, they will be able to go to the WTO court, and we’ll litigate. We also dislike some of the measures our partners take – we believe they, too, contravene the WTO rules and we don’t rule out that we’ll have some disputes resolved in the WTO court. The WTO court is an important instrument enabling the organization to exercise control over the performance of its members’ commitments. It enhances discipline, but it’s no use trying to predict its decisions. RBC Daily: It turns out that not only our producers, but also American companies have concerns about our accession to the WTO. U.S. trade unions have sent a letter to Congress warning the legislators about what they call “the possible expansion of Russian companies” on the American market. Do you think their concerns are warranted? M.M. : Russian chicken legs enjoying demand in the United States are no longer pie in the sky dreams. We used to sell aircraft and cars in America, and you can still see our cars in Europe. The WTO is not a magic wand. The organization can help create a favorable framework for exports, but membership alone won’t improve the competitiveness of our goods. We have to put in hard work. This is our internal task, a challenge for specific companies, managers, engineers and agriculturists. If we manage to spark business initiative, we will be able to deliver, and the WTO potential will work for us.